The United States is a nation that promotes freedom of speech and freedom of expression for all...unless you're the leader of U.S. forces in Afghanistan. Wednesday, President Obama ordered General Stanley McChrystal to resign after Rolling Stone published an article in which it was implied that Obama was more interested in photo ops than strategy. The article is scathing to the administration in several respects; for example, McChrystal calls National Security Advisor Jim Jones, a veteran of the Cold War, "a clown who remains stuck in 1985." McChrystal has also butted heads with Ol' Uncle Joe Biden over the surge strategy in Afghanistan. 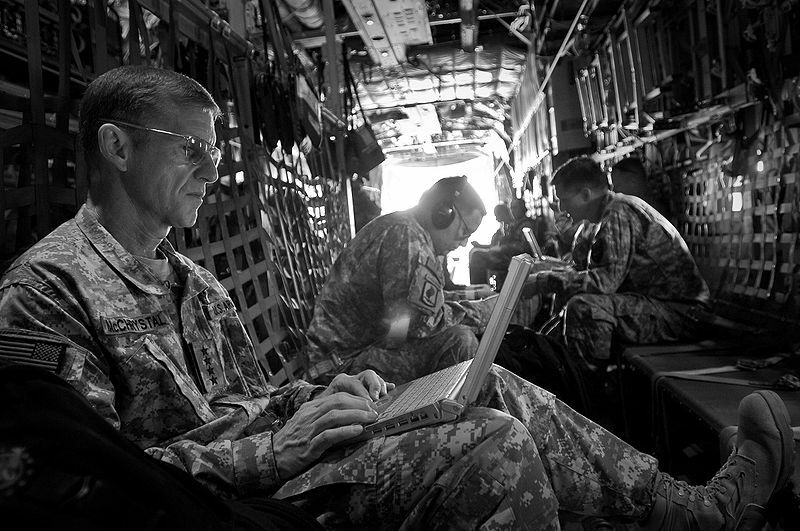 When pressed for comment on Biden, McChrystal dismisses the VP by saying "Who's that?" However, the most stinging rebuke in the article was against Obama himself. Regarding his first meeting with Obama, McChrystal thought that Obama looked "uncomfortable and intimidated" being surrounded by military leaders. Regarding McChyrstal and Obama's first one on one meeting, four months later, a McChyrstal aide said "It was a 10-minute photo op," and "Obama clearly didn't know anything about [McChyrstal], who he was. Here's the guy who's going to run his [expletive] war, but he didn't seem very engaged. The Boss was pretty disappointed." True, McChrystal's words may have hurt the "feelings" of the administration - an administration more concerned with being politically correct than winning - but, doesn't a man who has served in uniform his entire life, who has risked his life for his country, have the right to express his opinion about a president that has never served a day in uniform? Apparently the First Amendment doesn't apply to those that serve and defend our country. There's more happening here than appears as General McCrystal's comments are subject to court marshal and soldiers are regularly reprimanded/removed for less. Personally, I completely empathize with the General. Yet, someone is his position no matter how frustrated should know better than to act so viscerally and behave like a high school senior. His actions incite more disdain for Washington, juice-up the enemy etc. as well as to chip away at moral as it insinuates 'your leadership is laughable' (both civilian and military) and it's extremely unfair to push the latter on front line troops. So, he was given the boot with the door left open to stay a key player. Also, McCyrstal was made to apologize in front of the press...ouch. I think (if he hasn't done so already) he should apologize to his command.